Not a single isle at all but an archipelago of two major islands and a dozen smaller ones, the land called Summerset is the birthplace of civilization and magic as we know it in Tamriel. On its idyllic sea-kissed shores live the Altmer, the High Elves. The Aldmer, the progenitor races of all elves, arrived in Tamriel from their original home in Aldmeris or Old Ehlnofey in ancient times. We don't know what precipitated this exodus or even the location of Aldmeris if it still exists today. Most scholars believe that the Aldmer settled Summerset first, and then spread out across the rest of Tamriel, but there is some evidence to support the theory that Summerset was only one of several initial settlements of the earliest Aldmer. 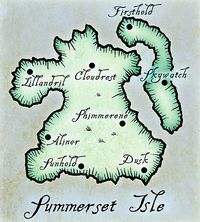 In any case, Summerset became one of the earliest centers of Aldmer civilization, which developed over thousands of years into the Altmer of historical times. What creatures and prehistoric civilizations these Aldmeris refugees faced have largely been lost in the mists of time. Cloudrest, atop Eton Nir, the highest mountain in Summerset, is a decidedly odd mixture of architectural styles, with buildings like strangler vines, built on top of other, older structures. The oldest of all the ruins there, and in a few isolated spots throughout the island, are made of coral, which must have been carried many, many miles away from the sea. The material and the style of the ruins strongly suggest that the Sload may have once counted Summerset as a part of their kingdom of Thras. More evidence of this may be found in the section on Thras in this Pocket Guide. The treasury of the Crystal Tower and the private collections in Summerset offer suggestions of other creatures the early Aldmer may have met in their new home, portrayed in sculpture and tapestry. Some of the beasts are surely (and hopefully) the work of the artist's imagination, but others appear with such regularity, it can only be that they once existed, as bizarre as they seem. Though no one alive has ever seen them, they have names out of legend: Gheatus, a man or a group of men who are formed by the earth itself; the Welwa, strange, holy beasts of horns and savage teeth, depicted as ravagers and saviors of the land; the Ilyadi, giants taller than the trees, with eyes that cover their heads. These extinct monsters, and others like them, had to be defeated by the Aldmer in days of yore. Early Aldmer society was agricultural and politically egalitarian. A system of ancestor worship had been exported whole from Aldmeris, and it brought with it a communal spirit that served the early settlers of Summerset well. When the Aldmer came together as a people to create the Crystal Tower, it was not a monument to any king or god, but rather to the spirit of the elven people, living and dead. Within the glittering walls of the Tower are housed the graves of the early Aldmeri settlers, preserved forever as a lasting symbol of the power of the people for that brief moment in history, fully unified. Gradually, as the society grew, social stratification increased. A hierarchy of classes began to form, which is still largely enforced in Summerset to this day. At the top are the Wise, teachers and priests, followed by Artists, Princes, Warriors, Landowners, Merchants, and Workers. Below Workers were the beasts, such as the enslaved goblins, who the Aldmer used to perform the jobs beneath the dignity of the very least of them. The religion of the people also changed because of this change in society: no longer did the Aldmer worship their own ancestors, but the ancestors of their "betters." Auriel, Trinimac, Syrabane, and Phynaster are among the many ancestor spirits who became Gods. A group of elders rebelled against this trend, calling themselves the Psijics, the keepers of the Old Ways of Aldmeris. With their mystical powers, they were able to settle in Artaeum, away from what they considered the corruption of their society. They continued to return to the land to act as advisors, but never again would they call Summerset home. It was about this time that many Aldmer left Summerset to settle the mainland of Tamriel. There was probably no single reason for this second exodus of the Aldmer, but some evidence, such as the famed Ramoran Tapestries — the very ones that show some of the creatures mentioned above — show how untouched and beautiful the mainland was considered to be by the Aldmer. Expeditions, such as those taken by Topal the Pilot and others, had painted an image in their minds of a great land where even workers at the lowest end of the Summerset hierarchy could live as kings. The Prophet Veloth was among those who led a group of discontented Aldmer away from Summerset to a new promised land. According to the traditions of Summerset, the Aldmer who went to be free on the mainland became all the disparate elven folk of history: Chimer, Bosmer, Ayleid. The ones who stayed behind became the Altmer. Even the earliest records of Summerset, however, shed no light on the origins of the Dwemer, who already occupied the northeast of Tamriel when Veloth and his people arrived there. The history of the Summerset Isle in the First Era and most of the Second is very much removed from the rest of mainland Tamriel. The rise and fall of Empires, the battles between man and mer, none of these touched the Altmer as a society. Internal conflicts between Skywatch and Firsthold, and between Alinor and Lillandril, often sparked into full war, but far deadlier were the repeated attempts at invasion from the alien lands of Thras and Pyandonea. The Sload of Thras, as we have mentioned earlier, may have been original inhabitants of Summerset, and so their repeated attempts to take the islands could be regarded sympathetically, if not for their methods. Physically unable to fight due to their massive girth, the Sload used necromantic magic and infernal machines to attack the Altmer. Though they never succeeded in reclaiming Summerset, if that was even their goal, they visited horrors upon the land which are still remembered today: the Sack of Skywatch in 2E 1301 [sic] and the War of the Uvichil from 2E 2911 [sic] to 2E 2917 [sic] are surely among the most terrible events in Tamriel's history. The Maormer of Pyandonea (described more fully in a later section of this Guide) were even more relentless in their drive to conquer Summerset. The chronicler can scarcely find a year throughout the First and Second Eras when the Maormer did not ravage the coastlines of the Altmer. As terrible as it was, it did force the Altmer to build a great navy to defend itself, and to this day, it is on the seas that the High Elves excel in combat. There are villages in the central valleys of Summerset that have never seen battle, but so much blood has been spilled along the coasts, it is a wonder it is not stained permanently crimson. The formation of the Aldmeri Dominion in the Second Era is discussed in the section on Summerset's ally, Valenwood. For Summerset, the kings of Colovia were no threat, but the Dominion allowed them to eliminate the Maormer outposts that had been established along the western coast of the mainland. Thus, the Dominion thrived until the coming of Tiber Septim. The conquest and assimilation of Summerset into the Empire is remembered by many a living Altmer with horror only partially diminished by time. Certainly, the pride of the people has never recovered. 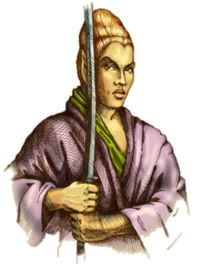 During the War of the Isle in 3E 110, the Maormer of Pyandonea were very nearly successful in conquering their ancient enemy, and the Altmer had to call upon the aid of the Psijics and the Empire to help defend themselves. Even as recently as twenty years ago during the Imperial Simulacrum, when the Altmer invaded Valenwood, their former allies in the Dominion, Summerset was only successful in capturing a small sliver of the coastline that used to be theirs. It is hardly surprising that to many in Summerset, particularly the young, it is time to reinvent what it is to be a High Elf. In the last few years, Summerset Isle has been at peace with its neighbors. To all outward appearances, it has returned to its normal state of unchanging tranquility. In fact, the Altmer are perhaps the most bitterly divided society in the Empire. The war in the province today is a cultural one, which has its origins with the surrender to Tiber Septim four centuries ago which shook Altmer society to its very foundations. While in Skyrim and Morrowind more blood has been shed in recent years, this struggle between the old and the new may have even more radical end results. The very future of the oldest province in the Empire of Tamriel is at stake. For thousands of years, the Altmer have implicitly believed in their superiority to all other races and cultures in Tamriel. For much of this time, they may have been right. But after the incorporation of Summerset into the Empire, doubts began to creep in. With the insularity of the Summerset decisively broken, many Altmer, particularly the young (which among the High Elves is a fairly loose term), began to take a more critical view of the rigid heirarchy [sic] of Altmer society and its strict cultural xenophobia. While there had always been discontent on the fringes of Altmer society, which was traditionally resolved by exile of the malcontents, for the first time a significant element of Altmer began to agitate for social change. This nascent revolution in the Summerset Isle has taken many forms. Most constructive, surely, is the acceptance of new cultures and races onto its shores, some occupying positions that would have been forbidden just a century ago. The Queen of Firsthold, for example, is the Dunmer Morgiah, daughter of Barenziah and sister of the King of Morrowind, Helseth. Her children, Goranthir and Rinnala, though half-Altmer, are fully Dunmer in appearance, and stand to inherit the throne. A darker side of this movement, however, is exhibited by a shadowy group who call themselves the Beautiful. Originally a salon for artists with the reasonable philosophy that Summerset must let go of its past in order to move forward, the Beautiful became a revolutionary gang dedicated to the destruction of the greatest monuments of Altmer civilization. The Crystal Tower was naturally an early target, and fortunately attempts against it have failed, but many other great, ancient sculptures and emblems of the past have been vandalized. Lately, the Beautiful have turned their attention to living symbols of the Isle, the royalty of Summerset. The particularly gruesome murder of the daughter of the King of Shimmerene has horrified and outraged the public. Finally, some of Summerset's youth are rebelling against their present, ironically, by embracing their past. The Imperial Geographical Society is not allowed to visit the isle of Artaeum to survey and document it, but there is little doubt that the Psijic Order is increasingly popular among the young, and is willing to exploit this. Over the past thousand years, only seventeen new initiates were brought into the order. In the past two years, however, another thirty have joined. Thirty new members of an Order may not be enough to be considered a surprising trend in most circles, but to the tradition-bound graycloaks of Artaeum, it raises many questions. What the Psijics' aim in this recent recruitment, however, is anyone's guess at this time.